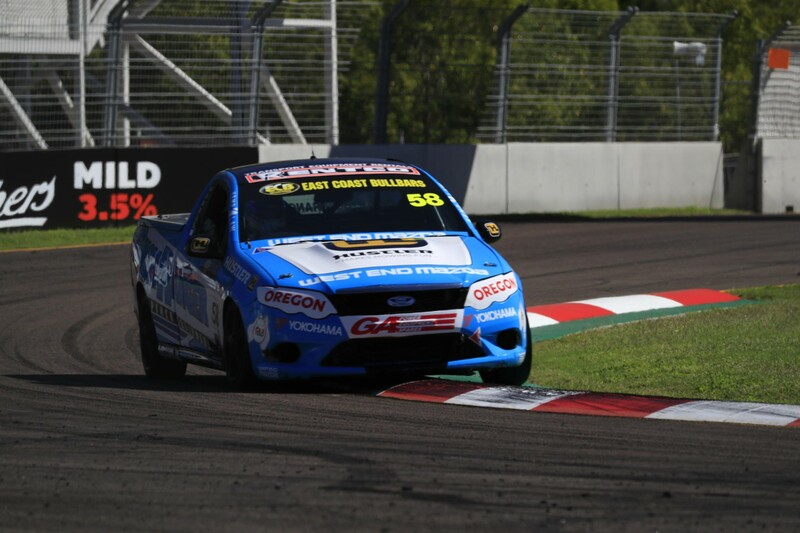 Ryal Harris has topped the times in practice for Round 2 of the Australian V8 Ute Racing Series at the Watpac Townsville 400, despite a differential failure in the day’s second practice session. Harris, whose Peters Motorsport Ford FG Falcon was fitted with a new engine after the opening round of the series at Winton, clocked a 1:23.3065 in this morning’s first practice session to end the day fastest overall, and also recorded the best time in the second session, held in hotter conditions, despite the diff expiring after four laps. “The diff failure wasn’t ideal, but the good news is it happened in practice and we clearly have a fast car this weekend,” team owner Rod Dawson said. Series returnee Craig Dontas was second overall for the day in his Sieders Racing-run Commodore Ute, ahead of Marcus Zukanovic. “The track conditions were better in the first session than the second, and that’s why most people were quicker this morning,” Zukanovic said. “In the second session, there wasn’t as much grip and people were finding the limits more easily, which is why a few people were locking brakes and running up escape roads… myself included! Kim Jane ended the day fifth, ruing his 50kg success ballast for leading the series. “The extra weight definitely makes a difference, you can especially feel it on the exit of slow corners,” Jane said. Debuting New Zealander Glen Collinson was sixth aboard the ex-Ryan Hansford Falcon, ahead of Michael Sieders, Matthew Spratt (who has taken over Mason Barbera’s IOR Petroleum Ute this weekend), Peter Ward and Blake Scibberas. Qualifying and Race 1 for the V8 Utes will be held tomorrow.